Tommy will be on the Stern Show Monday, 12.06.2004. This is his first radio appearance since his release from prison. He will be promoting the Marijuana-Logues which runs in New York December 7 through December 19, 2004 and then heads to California. See www.potshow.com for information on the Marijuana-logues. Update: For a summary, see Marks Friggin. During the interview, he discussed his incarceration, the Marijuana-Logues and made mention of the time Bobby Capps hung a sign from an overpass to protest his incarceration. Tommy Chong will be on the Tonight Show Tuesday, 11.30.2004. Update: Hysterical appearance, great jokes about Martha Stewart, promoted Marijuana-logues. Tommy said that he and Cheech were almost finished writing the reunion movie, but the director, Larry Charles, is now working on a TV project. As a result, the project will be delayed. During his appearance, Tommy salsa danced with Amy Poehler of SNL, during which she copped a feel. Way to go Tommy! Cheech Marin will be taping Dennis Miller this Tuesday, 11.30.2004. Dennis Miller airs weeknights at 9PM EST on CNBC. Air date: 12.01.2004. Update: More of a conversation, than an interview. It was funny, but didn't learn too much. Interview focused on Cheech's Chicano art collection and Christmas With The Kranks. As announced previously, Cheech Marin was on tonight's edition of "Inside Dish With Rachael Ray." During the show, Rachael received a tour of Cheech's gorgeous Malibu home. She was surprised to hear that Cheech and Chong are working on a reunion film. Apparently, she did very little research on Cheech. Cheech also announced that he signed to do another season of Judging Amy. IIf you missed the show, it will air again on The Food Network, 12.04.2004 at 6PM EST. 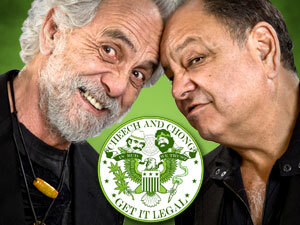 Cheech and Chong will be appearing on-stage together for first time in 20 years at the US Comedy Arts Festival. They will be discussing their movies and the characters they created. The official press release from Home Box Office isn't coming out til next week, but the Aspen Times leaked the info early. You'll be able to read more about it in publications such as Variety in the next few days. According to the Pittsburgh Post-Gazette, "two federal prosecutors and five federal law enforcement officers from Pittsburgh were among 224 people honored for outstanding work last week by the Executive Office of U.S. Attorneys in Washington, D.C.
Assistant U.S. Attorney Mary Houghton, who handles forfeiture, won for her work as team leader on "Operation Pipe Dreams," a nationwide prosecution of drug paraphernalia dealers, including actor Tommy Chong, that started in Pittsburgh." What a friggin joke! She won an award for convicting Tommy for smoking prop dope in a movie . That's like sentencing Marlon Brando for the Godfather films. Tonight we had the opportunity to catch the sneak preview of Cheech Marin's new film, Christmas With The Kranks. The film started off very slow, but picked up speed at the halfway mark. Most memorable is the Botox scene. Cheech Marin was great. His acting ability is superb. We are looking forward to seeing he and Tommy taking the lead roles in their reunion film. Overall, we'd give this film 2 out of 4 lids. moblogUK is giving you the chance to win the new Cheech and Chong DVD box set, Organically Grown. The box set was only released in Europe so it can only be played on Region 2 DVD Players. To enter you must send them your best smoking photo. Tommy Chong will be joining the cast of the MARIJUANA-LOGUES, for dates at the N.Y. Actors Playhouse December 7 through December 19, 2004 and premiering on the West Coast beginning February of 2005. It's a show that "illustrates that cannabis culture is a thing of substance, humor and creativity." It's been a widely popular show in NYC since it opened this past March. Read this article. Target is offering free wake-up calls from celebs on Black Friday (11.26). They want to ensure everyone wakes up early to start their shopping. Cheech Marin is one of these celebs. Tonight the Weedmaster was at the star-studded premiere of Christmas With The Kranks at New York's Radio City Music Hall. People began arriving shortly after 6PM. On hand were William H. Macy, Tim Allen, Eddie Murphy, Jake Busey, Caroline Rhea, Jamie Lee Curtis, WWF's Mankind and Dan Aykroyd, many of whom star in the film. But wait, we almost forgot....one of the two funniest comedians of all time, Cheech Marin, was there. He is also part of The Kranks cast. The Weedmaster had a chance to speak with Cheech during the long wait for his car. When asked about the reunion movie, he said that New Line is still in the process of writing the script and that the pot hair tonic concept is still the basis. The Weedmaster also asked him about where the Basketball Jones cartoon originated (the one featured in Being There). He said it was created by a friend of Lou Adler's to promote the Basketball Jones single and that the Being There producers just decided to use it. He didn't know where to get the full version, but we assume that Warner Bros owns the rights. Cheech was on his way to the UK for the launch of Sony's Cheech and Chong DVD box set we mentioned last week (see 11.03.2004 below). The signing is Friday 11/19 @ Fopp Charing Cross Rd @ Noon. The post-premiere party, which we did not attend, was held in Central Park. PHOTO MONTAGE or AP newswire photos from the event. The annual Cheech and Chong Dot Com Holiday Auctions begin Sunday 11.21. A dozen items will be up for grabs including sealed out-of-print albums, one-of-a-kind animation cels, rare promotional items, LPs, 45s and more. The featured item this year is Tommy Chong's personal storyboards which were used in the making of Nice Dreams. Round #1 begins 11.21.2004. Round #2 begins on or about 11.28.2004. Last week, we reported that the Bush administration was tired of Ashcroft's antics and were going to force him to resign. As promised, he resigned today. The legendary outlaw, Bobby Capps, is filing the necessary forms to get Tommy pardoned. Tommy had been prosecuted by Ashcroft for a crime he did not commit. It's time to clear his name. Bobby was pivotal in the Free Tommy movement. He performed numerous stunts designed to bring awareness to people, including hanging a sign from the side of a bridge and building snowmen with Free Tommy signs along Route 80. The first ever Cheech and Chong DVD box set will be released on November 15th. Ironically, the "Cheech and Chong Collection: Organically Grown In The US" will only be released in Europe. There is no planned release for the US. The collection includes Next Movie, Nice Dreams, Things Are Tough All Over, Born In East LA and Get Out Of My Room. Cheech Marin will be appearing on the November 26th (9PM EST) episode of a new Food Network show called "Inside Dish With Rachael Ray." Description: Rachael Ray travels to Malibu, CA for lunch at the beachfront home of Cheech Marin. Cheech takes Rachel on a tour of the grounds and talks about his extensive collection of Chicano art. Then, it's into the kitchen to prepare a banana blossom salad. No word on what kind of greens were in that salad. 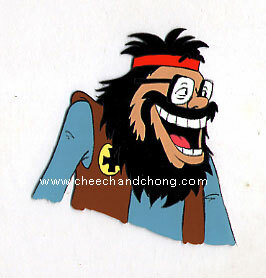 This isn't Cheech's first appearance on TFN. He was also on "Bill Bogg's Corner Table" back in 2000, where he introduced Bill to Aqua's ice cream sodas. Cheech is known for his culinary taste. He is part owner of the infamous Ana Mandara, a Vietnamese restarant in San Francisco, CA. Who's his partner? His Nash Bridges co-star, Don Johnson.